Pfeiffer has educated more than 14,000 alumni, enrolls 2,000 students and impacts the lives of many more through community outreach, programs, and training opportunities. 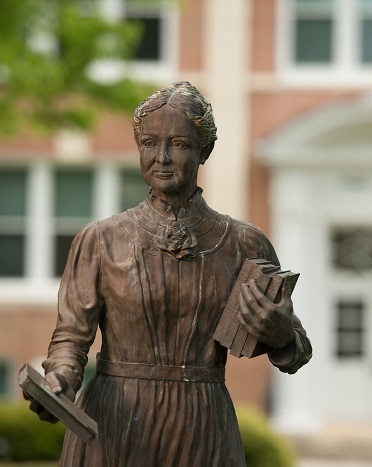 Today, those who share Emily Prudden's enthusiasm for Pfeiffer's mission are able to follow her example by investing in the university with a planned gift to the society that bears her name. Members of the Emily Prudden Heritage Society are alumni and friends of Pfeiffer who join this ongoing legacy by including the University in their estate plans. Members may have named Pfeiffer as a beneficiary in their will or utilized any number of other planned giving instruments to invest in the University's future. The ongoing goal of the university is to encourage and identify new members to join the society in an effort to sustain the mission of Emily Prudden and Pfeiffer University. Emily Prudden Park recognizing membership was created near the Misenheimer campus entrance in front of the Administration Building and was opened and dedicated during Homecoming 2017 ceremonies. This courtyard, which surrounds the bronze likeness of Emily Prudden, provides a place of reflection for student, faculty, and visitors. The names of members will be captured at this central campus feature to be remembered as partners in an ongoing legacy of education, ministry, and service.